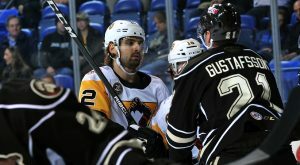 WILKES-BARRE, PA. – The Wilkes-Barre/Scranton Penguins lost on Sunday afternoon to the Providence Bruins, 4-2, at Mohegan Sun Arena at Casey Plaza. Wilkes-Barre/Scranton (8-8-3-1) kept things interesting in the third period with another valiant comeback attempt. Jarrett Burton’s late tally pulled the home team within one, but the two-goal deficit that they were facing in the final frame proved too steep to overcome. Special teams set the tone of the first period, starting with Providence scoring on the power play three minutes into the game. Ryan Fitzgerald finished a tic-tac-toe set-up from Jan Kovář and Ryan Donato, granting the Bruins the early lead. The Penguins answered with a man advantage goal of their own after Burton was busted open from taking a high stick to the face. Adam Johnson scored on the power play for the Penguins in the final minute of the opening frame, making Burton’s sacrifice worthwhile. Providence pulled ahead, 3-1, when Peter Cehlárik and Ryan Donato snuck matching markers past Anthony Peters midway through second period. The pair struck in a span of 65 seconds to give the Bruins a two-goal lead heading into the second intermission. Wilkes-Barre/Scranton proceeded to throw a barrage of shots at Zane McIntyre in the third period, and the Providence netminder made a series of unconscious saves to hold the Penguins at bay. Eventually, Burton finally put home the goal that cut the Bruins’ lead in half with 4:04 left in regulation. The Penguins pulled Peters and got the extra attacker on the ice in the final minute of the game in an attempt to conjure an equalizer. Instead, an empty net goal from Jakub Zbořil with 2.7 seconds left on the clock sealed Wilkes-Barre/Scranton’s defeat. Peters faced 18 shots and made 15 saves, while the Penguins ripped nearly twice as many shots in the direction of McIntyre. The P-Bruins’ goalie made 32 saves for the win.